I have my whole I-751 packet ready to box soon. It's one big stack about 3 inches high. Includes Cover letter, check, I-751 form and evidence sections. Each section has its own cover sheet and the cover sheet of each section has a section tab sticking out the bottom which signifies which section. I held each section together with paper clips and paper clamps. I did not use the 2 hole option as some people do. How should I box this whole stack? And how can I box it to present the stack from moving which might knock off one or more of the bottom section tabs which stick out? If it’s that large, 2 hole punch and fasteners is probably your best bet, especially bc you have no control over how the mail service you choose delivers it, but none are are ever gentle. Last thing you want is for items to shake loose and potentially be lost when USCIS opens it. USCIS seems to like the notion of denuding forests and making trees into paper. 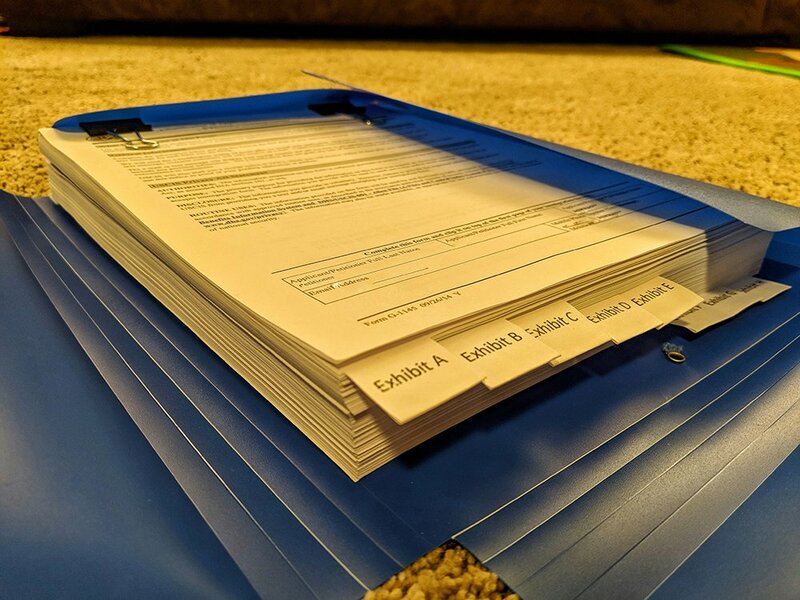 After all was said and done with our initial application and response to RFE, I believe the total weight of all of our submitted evidence was around ten pounds. We generally used the 2-hole top of paper punch and fasteners method. Good luck on your immigration journey. It will be worth it once it is all done. Didn't have time for the 2 hole punch unfortunately. Seems like this is a very good thing to do if you can! I simply placed a single metal at the top to hold everything in the assembled package together. Total weight was 1 lb, 6 oz. I sent it via a large USPS Priority Mail water-proof envelope. It was delivered.....hopefully in good condition......I'm now waiting for my check to be cashed. Our bank statements were almost half of the docs I submitted. Probably would've had around 1.5 lbs if not for those statements...well, here's hoping for no RFE. I tried with the binder clip, and even the biggest one I had didn’t hold the package. To amazon I went to spend $15 on a 2-hole punch and a box of 50 fasteners. I will likely never use the punch again and those remaining fasteners will last the rest of my life. This is what we did/send. Pics included. About a 2-inch thick stack, used acco fastners. That is epic. You win the I-751 "most organized filer" award - looks super professional! People would probably pay for that level of organization! As you can see, it just barely fit in the report cover thing...mine looks pretty bad comparatively, lol. I hope it'll arrive safely, that's my main concern. I think the rubber bands thing was a good idea...it made for easier handling. Just got wide labels and a template for word doc, then just printed vertically. From what I recall reading on here they scan everything in anyway and work off a computer, right? So not even sure there is a big need for arranging it in tabs? I agree.. fairly straightforward using labels that I already had, and a Word type software. Did take several weeks of effort, and in the end came out nicer than we expected. I had no idea Word had such capabilities. I wonder if there's a thread floating around somewhere on VJ explaining this for Word amateurs like me? I think they do just destroy all of our presentation efforts and scan it all into the computer at the end of the day. I personally think the tabs probably help them to understand the correct order and guide them into what exactly they are looking at at....so I still think it's worth doing.